One Liner Review: A Silly movie that pretends to have a message about a senator changing his style to hip hop and turning his speeches into rap. 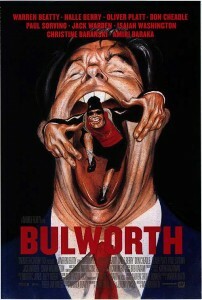 Bulworth is a very corny movie. i seem to remember it doing fairly well when it came out over a decade ago, and that’s kind of hard to believe. Did people really like this movie? it’s certainly different, and i suppose that is something better than just watching the same old tired thing (usually the problem with romantic comedies), but still, different isn’t always enough. the movie is about a senator who changes his image to hip hop. at the start of the film, he takes out a large life insurance policy on himself and then hires a hit man to assassinate him. it’s supposed to be this great, intriguing plot point as the hit man sits across from senator jay Bulworth (warren beaty) and opens the envelope. Bulworth talks of how the hitman can’t ask any questions about the person in the envelope and sets rules like that and it’s all build up to seeing who the person is. and it’s him, and that’s somewhat creative, but not enough to carry the movie as far as it thinks it will. the movie seems to assume that this initial setup is just cause to launch the senator into a world of hip hop, brought on by the idea that he is going to be dead soon anyway and so he doesn’t really care about his image anymore. with that in mind, Bulworth goes to a gospel church and tells the black people in the crowd the truth about how politicians don’t really care about them. it’s supposed to be shockingly funny, and maybe it is a little at first, but pretty soon this becomes the one joke of the whole movie. from the church, Bulworth goes to a party at a mansion for the entertainment industry. there he makes comments about the jews and how he is always looking out for them. nothing terribly offensive except to generalize that everyone in that business is a jew. it sounds worse than it really is, and that’s exactly the intention of the writer of this movie. to make it sound bad. from his limousine window outside the gospel church, Bulworth briefly met a girl named nina (halle BerrY) and her friends. the three girls are there again at the mansion party, this time volunteering as valet drivers. and at the end of the party, Bulworth invites them into his limo to come with him. 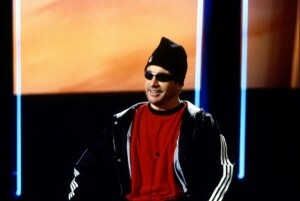 from this point on, Bulworth will be all hip hop. the girls come with him to a banquet hall where he makes a speech, and when he starts wrapping, they take out speakers and blast a beat. then they dance around the room, bopping up and down to the beat as he continues to wrap his message. how in the world this guy became an overnight rap expert is something the movie has no interest in addressing. it’s one of those areas where we are supposed to suspend our disbelief. still, it would have been nice if the movie offered some sort of justification. Bulworth goes to a club with the girls where he ends up dancing with nina and starting up a little affair with her. he’s married, but that never really becomes an issue for this movie because his wife christine baranski is cheating also, with william baldwin. as we continue on through the movie, we start learning the truth about nina and this is supposedly meant to change our perception of her. 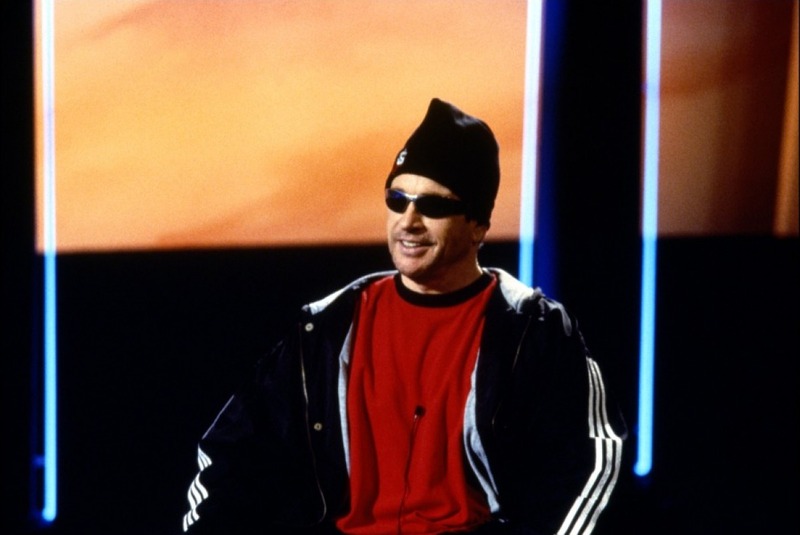 but we’re too busy trying to understand Bulworth and how he became a senator to begin with and whether or not he was always this crazy. And this is a problem for the movie. we never saw him before the change. 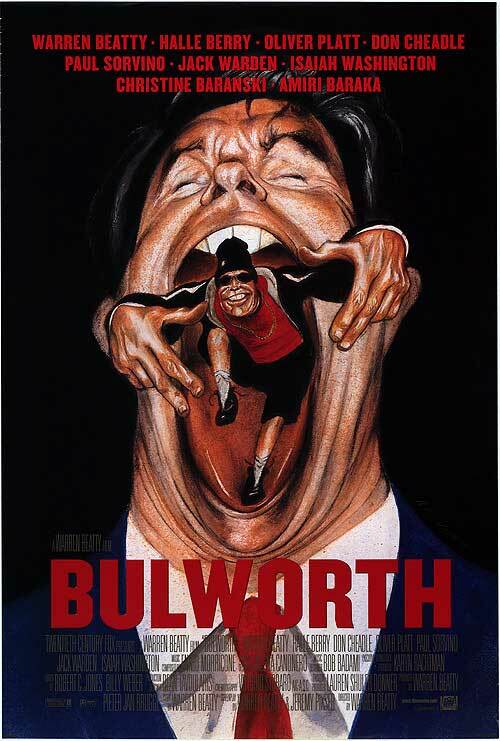 From the very start of this movie we saw Bulworth being off his rocker. the movie opened with him crying in his office in the middle of the night with tapes of his speeches and commercials being played over and over again on a loop. and then he had the hitman meeting and then went to the gospel church. so while we are meant to believe that he used to be this very serious guy and now this hip hop act is a radical departure from that, we never get to see what the old him used to be like. there isn’t really much depth here. the comedy is pretty much black and white and not the least bit funny at all. there are the two girlfriends of nina, who end up hanging around the Bulworth campaign team long after both Bulworth and nina have gone. these two girls make idiotic comments all in the name of attempted comedy. and as if they weren’t bad enough, chief advisor oliver platt is a cocaine addict who is going crazy himself, especially about trying to get Bulworth to certain places at certain times. instead of getting angry about Bulworth’s behavior, which might have actually been funny, platt just goes with it, acting like everybody and everything is okay and he should just do more coke. the movie becomes a little too democratic and political as it continues on and starts to deal with kids and their mistreatment by cops. don cheadle plays a drug dealer who is meant to be seen as a good guy because he cares about the kids. he cares enough to give them jobs selling drugs and guns to carry in the streets. it’s all ridiculous. the movie has an adequate storyline, and that’s being generous. but every time it opens its mouth to attempt to be funny, it falls flat on its face. halle berry might be doing the best acting in this movie simply because she’s the only actor being somewhat serious. the rest of them act like a bunch of fools and expect us to laugh. it’s not the least bit funny at all.